Best Motorola Devour for Verizon Wireless has arrived and it’s your chance to get the best deal on Motorola Devour for only $49 after instant discount. Yup, there is no need to submit a rebate form. You can have this new Android smartphone at the incredibly low price. The Motorola Devour is preloaded with Google’s popular Mobile Operating System – Android 1.6 plus MOTOBLUR service. What I love about the unique MOTOBLUR service is that it delivers real time updates from your email and favorite social networking sites directly to the phone screen. The latest photos, videos, and posts from Facebook, Twitter, and MySpace can be viewed directly on your Devour’s home screen without first logging into each site or application. You can share your post and pictures all in one click from the home screen. Lots of popular apps from Google and Verizon Wireless have been preloaded into the phone. And if you need more, there are tons of free apps available for the Motorola Devour. For rich and desktop like web browsing experience, the Verizon Devour rocks. And the best Motorola Devour deal won’t last too long. So hurry and get yours today while supplies last. You can get the cheapest Droid phone at the price of $149 with no rebates required. And what about the cheapest Droid plan? 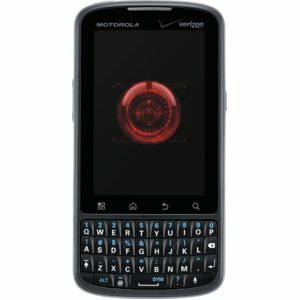 There are a number of Droid wireless plans to choose from Verizon Wireless. Depending on anytime minutes and features you would like to add, the basic and also the cheapest Droid plan starts at $39.99. However, Verizon Wireless requires you to add a data plan on top of the voice service. So, adding the $30 PDA/Smartphone Personal Email and Web service will bump up the monthly service to $69.99. Yup, that’s the cheapest Verizon Droid plan you can have. You want a simple, solid, and elegant flip phone? The free Motorola KRZR K1m for Sprint is just what you need. The KRZR evolved from the popular Moto RAZR line and yet more beautiful than any RAZR phones. The distinctive metallic gloss finish and external touch-sensitive controls set it apart from regular flip phones. One of the nice features we like is that the Moto KRZR K1m is capable of running the Sprint’s 3G network, which means you get faster music download or streaming. You can also stream live mobile TV from Sprint. Not that many flip phones can do that. Getting lost on the road? No problem, the Sprint KRZR K1m offers you turn-by-turn direction with Telenav. What else can you do with the Sprint KRZR? Taking pictures and videos with built-in 1.3 megapixel camera. Although you can find better camera on some smart phones. For the price and slim compact form factor, it’s sufficient enough for everyday use. The battery has amazing standby time of up to 440 hours, that’s about 18 days with a single charge. The KRZR K1m is no doubt one solid and beautiful flipphone from Motorola. Get your free Motorola KRZR K1m for Sprint now and get free shipping via 2 day FedEx express.